That’s a tough one because there is no typical day, because we write a new schedule every day to suit the needs of the campers. Most days, campers have a full schedule of structured activities, punctuated by free plays after lunch and after dinner. Since schedules are written daily, campers have an opportunity to make suggestions for their next day’s schedule. If, for instance, an age group is in the midst of a fun roller-hockey competition or lightning ball match they may ask to play again the following day. Our day begins with morning visits to each bunk from camp group leaders. Campers come together with their counselors to the dining room and the day begins! Campers eat with their bunks and their counselors. Food is served buffet-style. Before lunch and dinner, campers and staff gather for all-camp announcements including honoring campers who achieved something special that day. 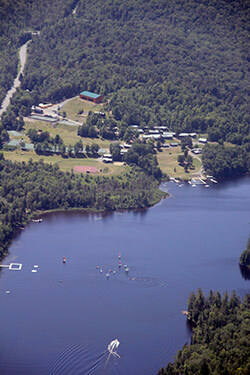 There are three activity periods in the morning and three in the afternoon for junior and intermediate campers. Occasionally, junior and intermediate campers have a choice of activities where they can split from their bunk groups. They can and spend a relaxing afternoon sailing, head to the tennis courts, enjoy Art & Crafts, go on a nature hike, play music, etc. Senior campers are assigned to “Senior Electives” in the morning and have three structured activity periods in the afternoon. Seniors create their own elective schedules. There is at least one free swim period every day for all campers. Campers who choose not to swim can participate in other activities such as basketball or tennis. Optional intra-camp leagues are available to all age groups in soccer, baseball, basketball, roller-hockey, lacrosse, flag football, ultimate Frisbee. Of course campers might be involved in rehearsals for shows, participate in tournaments, be on a hike, or on a trip, all which would be worked into their schedule for the day. In addition to their daily schedule, there is always an evening activity. Some of our special evening activities are talent shows, scavenger hunts, tag games, and campfires. Snacks are served after afternoon free play, and after evening activity. Campers return to their bunks after evening snack. They take showers, write letters, and play quiet games, listen to a story until lightsout, which begins at 9:00 p.m. for our youngest campers, and increases every 15 minutes for each older grade group. There is a counselor on duty in each bunk at all times.